The Best Alzheimer blogs from thousands of top Alzheimer blogs in our index using search and social metrics. Data will be refreshed once a week. Also check out Alzheimer Podcasts and Alzheimer Youtube Channels list for Top videos on Alzheimer. Alzheimer newsletter is a comprehensive summary of the day's most important blog posts and news articles from the best Alzheimer websites on the web, and delivered to your email inbox each morning. To subscribe, simply provide us with your email address. About Blog Alzheimers subreddit is a place for people effected by Alzheimer's Disease and dementia to support one another and share news about Alzheimer's Disease and Dementia. Facebook fans 1,076,515. Twitter followers 463,067. Scotland About Blog Alzheimer Scotland is Scotland's leading dementia charity - providing information, practical services and emotional support to people with dementia and their carers. Our mission is to provide and to secure the provision of high quality services for people with dementia * To provide and to secure the provision of high quality services for carers of people with dementia. Facebook fans 18,238. Twitter followers 16,540. United Kingdom About Blog We are the UK’s leading research charity aiming to defeat dementia. We power world class studies that give us the best chance of beating dementia sooner. Our pioneering work focuses on prevention, treatment and cure. Facebook fans 100,191. Twitter followers 59,891. About Blog This website was created to offer the most up-to-date Alzheimer’s disease (AD) information to educate family members and caregivers, and provide help for people with mild memory loss due to AD. Learn about AD prevention and treatment through lessons created by a team of experts. Facebook fans 52,789. Twitter followers 88. About Blog The Alzheimer’s Association is the leading voluntary health organization in Alzheimer care, support and research. Our mission is to eliminate Alzheimer's disease through the advancement of research; to provide and enhance care and support for all affected; and to reduce the risk of dementia through the promotion of brain health. Our vision is a world without Alzheimer's disease. Facebook fans 777,037. Twitter followers 104,480. New York, NY About Blog The Alzheimer’s Drug Discovery Foundation (ADDF) is the only venture philanthropy whose sole mission is to accelerate the discovery and development of drugs to prevent, treat and cure Alzheimer’s disease. Our mission is to rapidly accelerate the discovery of drugs to prevent, treat and cure Alzheimer's disease. In 2014, 100% of donations went directly to Alzheimer’s drug research programs. Facebook fans 5,690. Twitter followers 7,986. Toronto ON About Blog The Alzheimer Society of Toronto provides free counselling, education & information to people with Alzheimer’s disease & other dementias, their families, & caregivers. We also deliver specialized training and professional development for frontline health-care providers, as well as public education and awareness events to increase accessibility to dementia information. Facebook fans 3,847. Twitter followers 6,450. Minnesota About Blog Alzheimer’s erases memories and takes the power of speech with it, preventing people with the disease from expressing their needs and wants. Alzheimer’s Speaks is a mouthpiece for those silenced. It also serves as an outlet for caregivers and loved ones too overwhelmed to have their say. Facebook fans 2,148. Twitter followers 7,404. Facebook fans 55,309. Twitter followers 104. Houston & Southeast Texas About Blog The Alzheimer's Association of Houston and Southeast Texas consists of families, caregivers, scientists, health professionals, and concerned citizens who are committed to finding a cure for Alzheimer's Disease and to easing the burden of Alzheimer's Disease and related disorders on patients and their families and loved ones. Facebook fans 5,509. Twitter followers 2,381. The Long and Winding Road About Blog Her mother’s 10-year battle with Alzheimer’s inspired blogger Ann Napoletan to launch a second career as an advocate for those with dementia as well as for their families. Through her blog, she seeks to support others with news on research and practical tips. Ann Napoletan uses her personal experience to help others touched by this disease. Facebook fans 1,263. Twitter followers 725. About Blog This blogger changed her legal name to Truthful Loving Kindness in order to remind herself and others of why it’s important to be and exhibit all three traits. Diagnosed with mild cognitive impairment (MCI), which is often a predecessor to Alzheimer’s, she shares the realities of her symptoms and how she manages them. She also regularly discusses the role that spirituality plays in her daily life. Virginia, USA About Blog This is my journal of sorts in dealing with Early On Set Alzheimer's Disease. Blog by Kay Bransford. San Antonio, TX About Blog Seasons Alzheimer’s Care and Assisted Living provides the best memory care facilities for seniors in San Antonio TX! We provide the finest assisted living regarding each patient’s needs. Facebook fans 272. Twitter followers 132. Austin, Texas About Blog Alzheimer’s Texas provides information, referrals, and a variety of support programs for those with Alzheimer’s disease and related dementias, and their family members, caregivers and professionals. To eliminate Alzheimer's disease and related disorders through the advancement of research and to enhance care and support for individuals, their families, and caregivers. Facebook fans 1,116. Twitter followers 403. Facebook fans 271. Twitter followers 74. About Blog Early onset Alzheimer’s only affects about 5 percent of people who develop Alzheimer’s and begins prior to 65 years of age. When it happened to the husband of blogger Linda Fisher in 2008, she was inspired to launch a blog that provides wisdom, support, heartfelt stories, and practical advice for people who have Alzheimer’s as well as their caregivers. Facebook fans 11. Twitter followers 83. George, South Africa About Blog Our mission is to care for people living with Dementia in our home-like facilities, specifically designed to ensure that the desired outcome is ‘living well with Dementia’. We maintain or enhance quality of life and optimal general well-being with passionate management, multi professional team services, compassion and respect. Facebook fans 6,228. Twitter followers 48. About Blog Blog by Jean Lee. I've written Alzheimer's Daughter about my parents' simultaneous descent through the disease that took both of their lives within a year of one another. London, Findhorn About Blog The Gift of Alzheimers book is trailblazing, bringing insight and understanding to Alzheimer’s and shedding new light on this devastating disease. Facebook fans 643. Twitter followers 200. About Blog This site is a work-in-progress designed for visitors to read one or more of my published articles dealing with Alzheimer's. About Blog This blog was started so that Alzheimer’s patients or people suffering from other types of dementia have a place to go and read about living faithfully in spite of their disease. The devotional blogs contain scripture from the NIV Bible with a few words about how it applies to living with dementia from the author’s perspective as he battles Early-onset Alzheimer’s disease. About Blog This blog is for those who suffer from Alzheimer's Disease, FTD and forms of dementia, caregivers, friends and medical professionals that want to share their feelings, thoughts, encouragement, vent and open how they cope with this disease. I was diagnosed in 2004 with the early stages, and quite frankly it scared the beegeebees out of me. About Blog Utilizing a patent pending process called Altus Oscillation™ for enhancing carefully selected music, we have developed a non-pharmaceutical product capable of comforting Patients while providing valuable relief for their Caregivers. Our goal is to provide a few hours of human peace each day for what will be both the Patient and Caregiver’s long and arduous journey. Facebook fans 16,425. Twitter followers 37. About Blog Blogger Pat White has been building a community of readers since 2009. That's when she began caring for her mother, who was diagnosed with Alzheimer’s in 2007. Her tips and insights for adult children like a poster she made for her mother featuring images of family members, to help trigger happy memories are especially helpful for those whose loved one resides in a memory care community. Ireland About Blog Disrupting Alzheimer’s is committed to researching, developing and implementing new strategies that support independent living for those affected by Alzheimer’s and other neurological diseases. Disrupting Alzheimer's aim is to support carers looking after loved ones in the family home . Facebook fans 281. Twitter followers 214. Bethesda, MD About Blog MedlinePlus is the National Institutes of Health's Web site for patients and their families and friends. Produced by the National Library of Medicine, the world’s largest medical library, it brings you information about diseases, conditions, and wellness issues in language you can understand. MedlinePlus offers reliable, up-to-date health information, anytime, anywhere, for free. Facebook fans 9,494. Twitter followers 94,358. USA About Blog The Fisher Center is one of the largest and most modern scientific facilities in the world dedicated to solving the puzzle of Alzheimer’s disease. The Center serves Alzheimer’s patients and their families by seeking to understand the causes of, discover a cure for, and improve the lives of people with Alzheimer’s disease. Facebook fans 5,821. Twitter followers 29,428. Massachusetts About Blog Senior Living Residences of Braintree manages Independent Living, Assisted Living and Memory Support, Alzheimers Care communities throughout Massachusetts. Facebook fans 425. Twitter followers 274. About Blog The John Douglas French Alzheimer's Foundation funds innovative Alzheimer's research, focusing on new areas—generally not being explored by other organizations—in order to accelerate finding a cure. Our Mission is to accelerate finding a cure, or a way to delay the onset and advancement of Alzheimer’s disease, by funding innovative research in new areas of discovery. Brooklyn About Blog This blog will be a place to post poetry written by people living with Alzheimer's disease. We will focus on poetry that is created as part of the Alzheimer's Poetry Project. We will post information and news about dementia. We hope this blog is of use to the family members who have a loved one with dementia. Facebook fans 550. Twitter followers n/a. Los Angeles, CA About Blog I'm a journalist, producer, author & mother. My mission is to inform, inspire & ignite people to be Architects of Change in their own lives & communities. My mission is to inform, inspire & ignite people to be Architects of Change in their own lives & communities. Facebook fans 484,626. Twitter followers 2,350,002. About - We’re the UK’s leading dementia charity. We provide information and support, improve care, fund research, and create lasting change for people affected by dementia. Our mission is to change the landscape of dementia forever. Our vision is a world without dementia. About - Alzheimer’s Research UK is the UK’s leading dementia research charity. As research experts, we specialise in funding world-class, pioneering research at leading universities and institutions to find preventions, treatments and a cure for dementia. Our findings improve the lives of everyone affected by dementia now and in the future. About - Alzheimer Scotland is the leading dementia organisation in Scotland. About - Using our 15 years experience as health and social care trainers, we have created activities and games for people with dementia and learning disabilities. 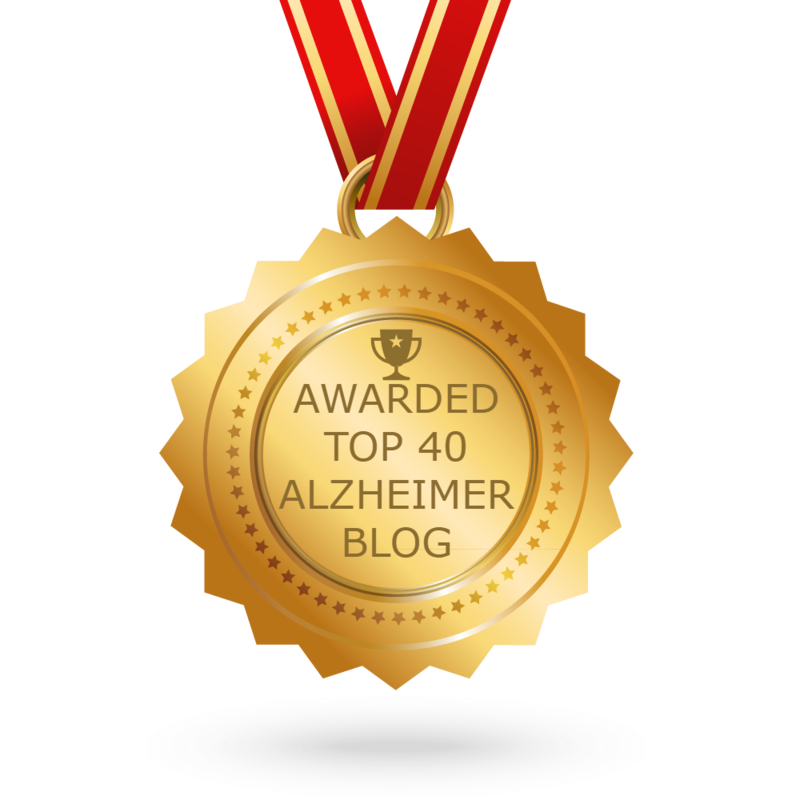 CONGRATULATIONS to every blogger that has made this Top Alzheimer blogs list! This is the most comprehensive list of best Alzheimer blogs on the internet and I’m honoured to have you as part of this! I personally give you a high-five and want to thank you for your contribution to this world.